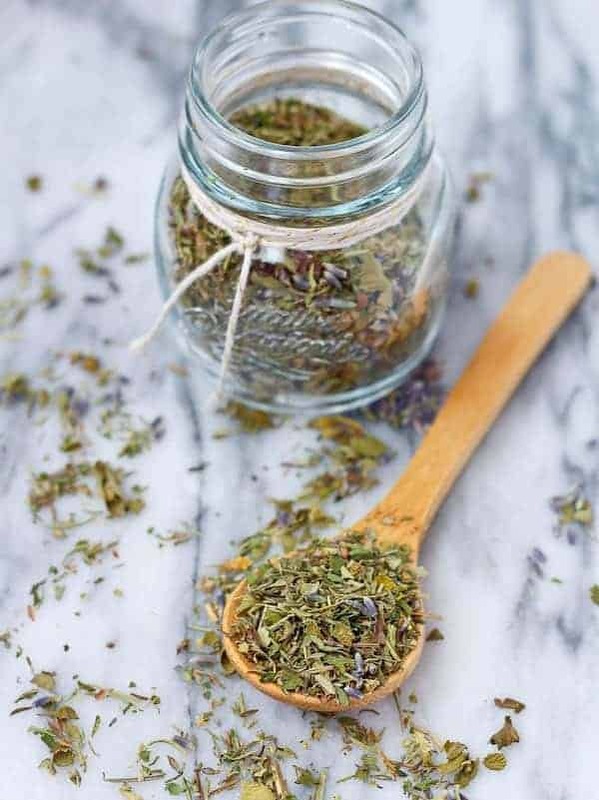 Use this Herbes de Provence recipe to make this fragrant herb mixture at home – it’s easy and you’ll know you’re using quality ingredients! It would be great for gifting — time to start thinking about holiday gifts! It would be delicious on a big ol’ beef roast — ideal for a Christmas dinner. It’s a good way to get tons of herby flavor into your food even though your beautiful herb garden is covered in white fluffy junk. When I was in high school we traveled to France and stayed with a family there. It came out out of us having an exchange student, and the relationship with her family grew until we were all good friends. We had the privilege of staying with them for a few weeks as we traveled around France with the best tour guides possible, the French people. Anyways, it probably goes without saying that the food was great. My mom and I have different memories of this, but I remember them sprinkling Herbes de Provence over fresh salads. 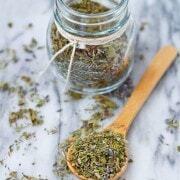 Regardless of if they did it or not, it would be another great use for this DIY herb mixture. I teamed up with SpiceJungle to bring you this recipe. SpiceJungle is Beanilla’s new venture into spices, teas, salts, chiles, mushrooms and more (over 400 products!). Beanilla is located in my hometown and they are my go-to for all things vanilla. Needless to say, I’m very excited about this new online store. The wonderfully fun descriptions of each of their products make browsing their website truly enjoyable. I did a fair amount of Herbes de Provence recipe research, and what I found is that every recipe is different. Some include lavender, some do not. Some include fennel, but fennel seeds aren’t my favorite. If you choose to switch it up a little, let me know in the comments what you put in your Herbes de Provence mixture! I’d love to hear! 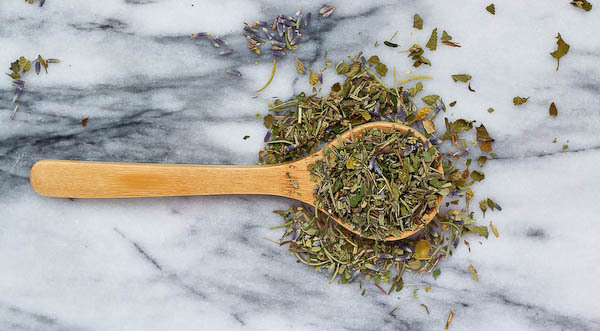 What is Included in Herbes de Provence? This Herbes de Provence recipe really couldn’t be easier to throw together. I didn’t even dirty a spoon…all I did was put all the ingredients in a jar and gave it a little shake. You can use it as is, or you could use grind it up in a spice grinder. Or you could wrap it up in cheesecloth to infuse the flavor into a soup. Endless possibilities! 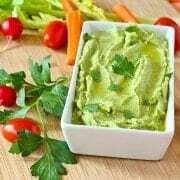 Optional: Blend in a spice grinder or using a mortar and pestle if you prefer the herbs to be a finer texture. Looking for more DIY spice mixtures? Check out my taco seasoning, large batch taco seasoning, pumpkin pie spice, and beef stew seasoning! Or you can check out my complete list of homemade spice blends. *Disclosure: This post was written on behalf of SpiceJungle. I was compensated for my time but all opinions are my own, as always. Thanks for supporting my blog by reading about brands I love. 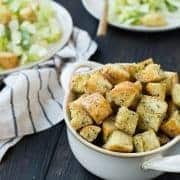 Caesar Croutons – EASY recipe! I am that kind of person who loves cooking but got no time to make my own recipe of herbes de provence so I purchase a ready made one online. That works too, but it’s so easy to make one at home! Plus it’s great in a pinch or if you don’t use a lot of this particular blend. Homemade spices are always SO amazing! Cannot wait to try this! 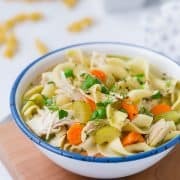 I love this combo on my favorite roast chicken recipe! YUM! Love this idea for gift giving! Gorgeous photos, Rachel! Homemade spices are the best- so much fresher too. I love to sprinkle herbes de provence on oven fries! And I could totally use some new herb to restock my new kitchen! 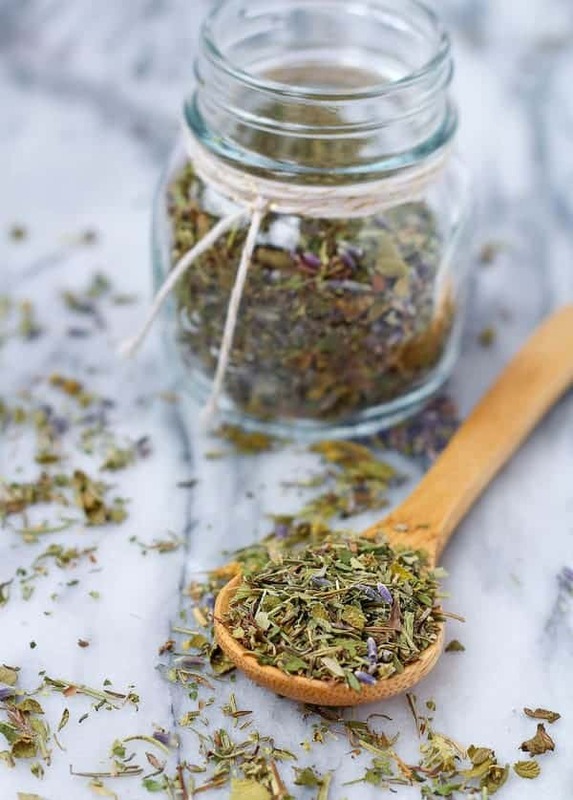 Herbes de Provence is one of my favorite spice blends! I use it on just about enduring. I can’t wait to make it myself. P.S. Beanilla is doing spices? Woo-hoo! I love the idea of homemade spice blends – I can only imagine how amazing it smells! This would make such a fun holiday gift for neighbors or co-workers too. oh I can just smell the flavors right now!! I bet it’s incredible!! I can’t wait to make my own! I love herbes de provence but reading this I think I have spelled it wrong in every single recipe, ha ha. Great idea to make your own, I am so doing this!